Lesser cornstalk borer (LCB) is probably the most serious pest of peanut in Georgia, and we are seeing quite a bit of LCB activity. This pest thrives in hot, dry conditions and light sandy soils…something we have plenty of in South GA right now. Fields need to be scouted to determine if LCB is present. When scouting for LCB, several locations should be checked in each field. We have been looking at every plant in three feet of row at each sampling location. The caterpillars are most easily found if you pull up the plant, but it is not practical (i.e. growers will not tolerate it) to remove large numbers of plants from a field. Instead, pull one to three plants at each location and examine the remaining plants very carefully. You will be looking for larvae, feeding damage, and silken tubes covered with soil (a soil covered silk tube is pictured below). The larvae can be difficult to find as they will often be inside the silk tubes or inside the stems of the plant. 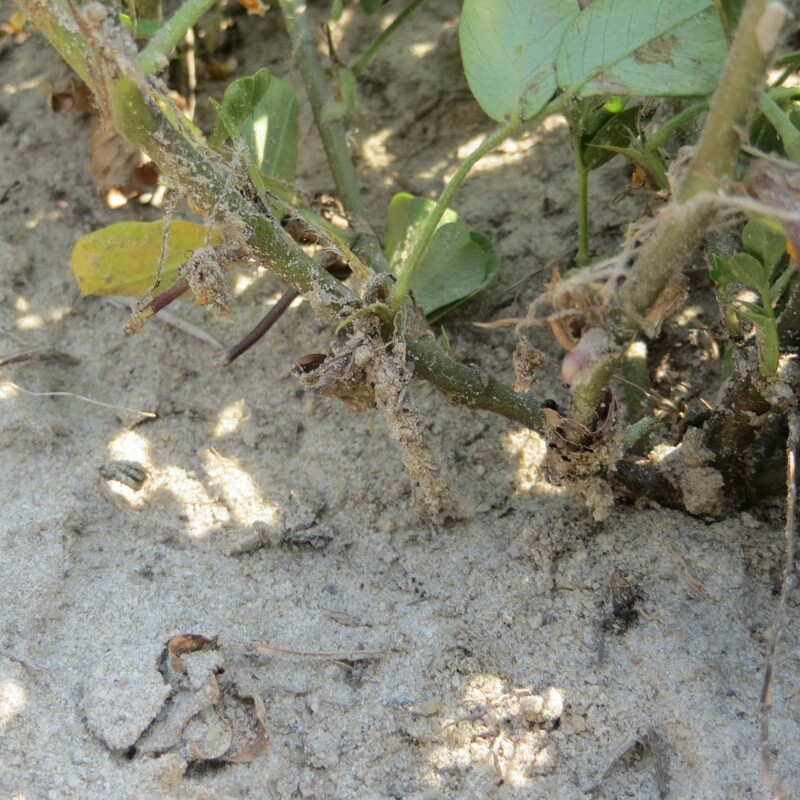 You may also see LCB moths flushing from the peanut foliage as you walk through fields. Granular chlorpyrifos (Lorsban 15G) is currently the only material recommended for LCB control in the UGA Pest Management Handbook. This product CAN NOT be applied by airplane to peanut. Liquid formulations of chlorpyrifos are NOT REGISTERED for foliar application in peanut. Granular chlorpyrifos must have rainfall or irrigation to be effective. Rainfall and cooler temperatures will slow LCB populations, but once we get into an outbreak situation, we should not expect rainfall to alleviate the problem. Posted in Agriculture, Peanuts. Bookmark the permalink.